Scattergood Baines is the "shrewd and jovial hardware merchant who finds himself draw into just about everything that happens around him. Scattergood Baines is the best loved, most cussed at, and by all odds the fattest man in the modern, bustling town of Coldriver." Scattergood Baines offers down home wisdom to anyone that will offer him a plate of food (but usually they just ask) as he is the fattest man in town. As the local hardware merchant, the town's locals come to Scattergood with their wild assortment of stories, problems, and backgrounds. 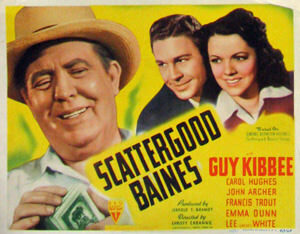 The character Scattergood Baines was created by famous American author Clarence Budington Kelland. The author based Scattergood Baines on memories from his childhood in Portland, Michigan. This collection is also part of the Rare Soap Operas Collection. These are very rare shows but the sound quality is great. For more tales of fat protagonists, see also: Down our Way, Big Guy, Fat Man, and Nero Wolfe. Be the first to comment on "Scattergood Baines"